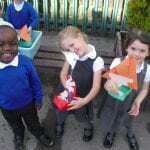 Birdwell Reception Blog » Blog Archive » We made our own boats! We made our own boats! This week we have been focusing our learning around the story ‘Stickman’ – we noticed in the story that Stickman could float and thought we would try and make some boats so he could get back to the family tree safely. 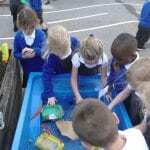 We used different materials and then did some experiments outside to see if they would float or sink. After that we used other natural materials like leaves, conkers, pinecones and sticks to see which would float and which would sink!